Home to mighty, snow-capped peaks and shimmering lakes, Wanaka ranks among New Zealand’s top destinations for adrenaline-pumping outdoor adventure. On this tour, enjoy 60 seconds’ freefall and float effortlessly through the air on a tandem skydive with your instructor. 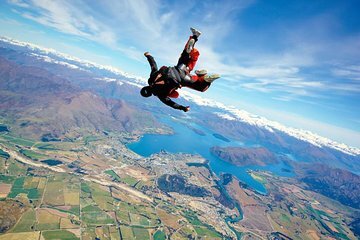 With round-trip travel from your central Wanaka accommodation included, enjoy spectacular views over the Southern Alps and experience high-altitude thrills in the heart of the South Island.